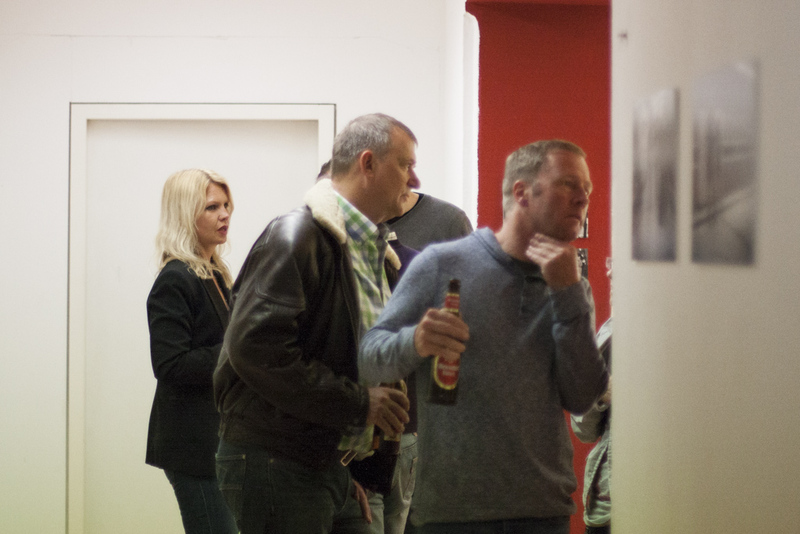 Monday was the day of the vernissage of my exhibition in Cologne. It was a really fantastic evening and I had a great time. My dad and quite a few of my friends were there as well and I got some really nice and interesting feedback. Some people even pointed out details in some pictures that I myself hadn’t even noticed yet. I would say that the whole event was quite a success and I have to say that I was a bit overwhelmed by it all. It is so strange to be the centre of attention like this and quite draining as well. Rather unsurprising that I needed a bit of a break yesterday after all the excitement. 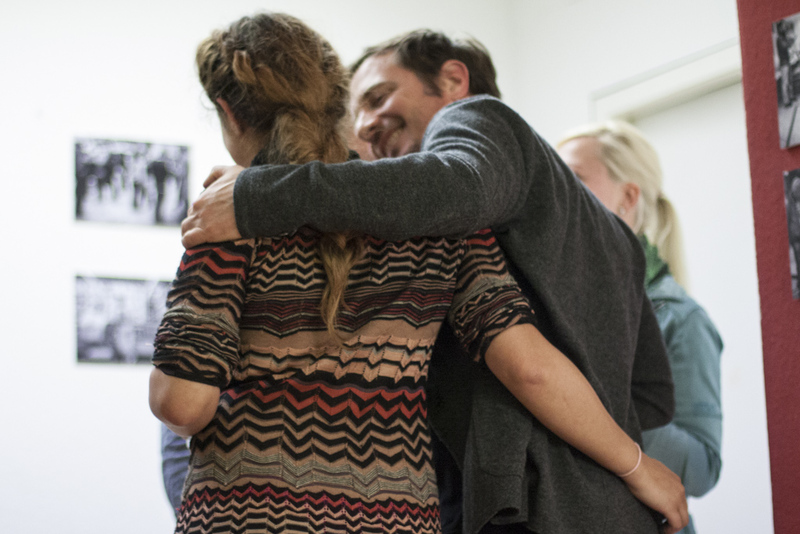 Nevertheless, last night I sat down to edit the pictures that I took at the vernissage. I was even a little surprised to realise that the pictures turned out quite alright, although I was rather busy talking to people and therefore quite distracted. And yes, I decided to go with colour for these. You know that I prefer black and white, but in this case the red and green walls, the yellow jackets and red sleeves were just too enticing, especially in contrast with my black and white pictures on the walls. White balancing was of course a nightmare, because the light sources were a rather mixed bunch. It would have needed a new grey card shot in every one of the different corners of the place and of course I don’t even own a grey card, being a black and white photographer normally! Not having to deal much with white balancing is one of the many advantages of shooting black and white, I’d say. 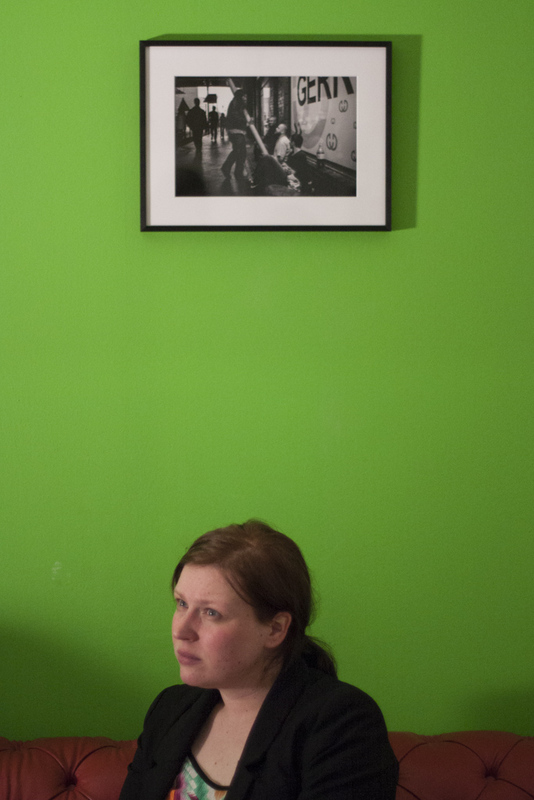 This was actually taken the night before, just after hanging the pictures. The following taken with: Canon EOS 450D and Canon EF 50mm f/1.4. My dad looking at one of my pictures. 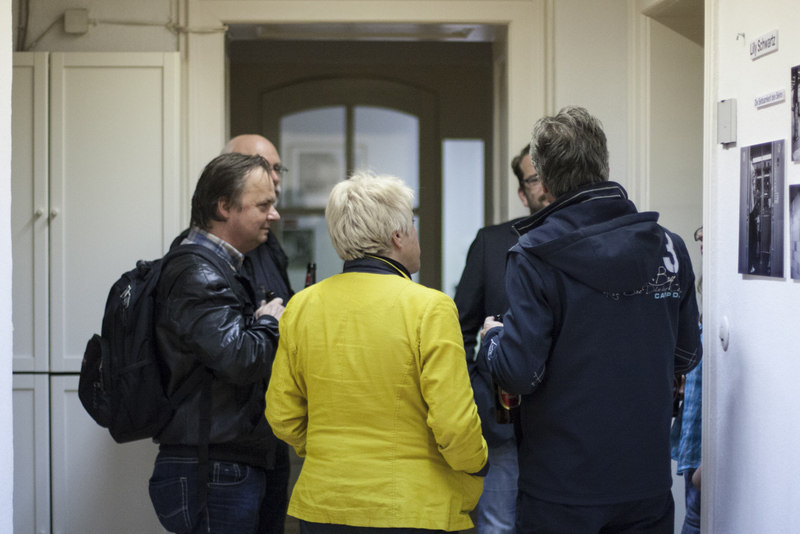 Sadly I only caught writer Katja Bohnet from behind this time. 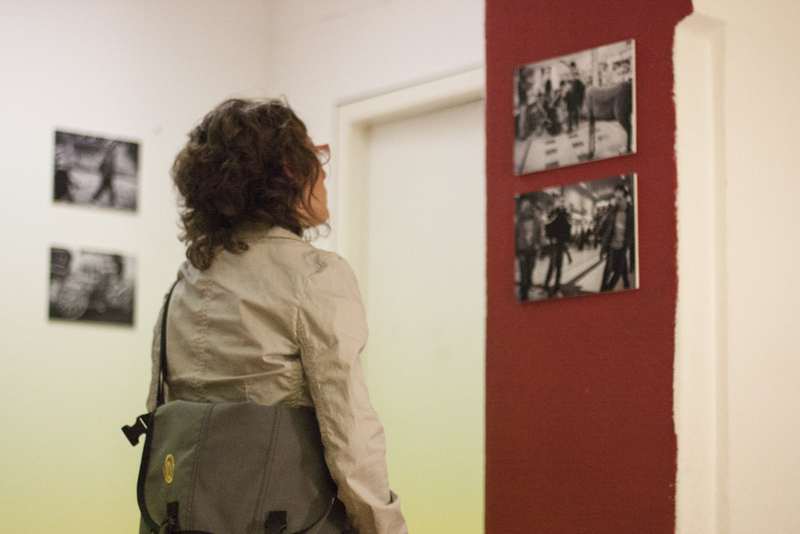 If you’d like to see her from the front, then you can find another picture of her among the impressions from our group exhibition in Dresden where she was reading one of her stories. I would like to point out another friend of mine hiding in the doorframe. She doesn’t like to be photographed although she herself tends to go out picture hunting with her Canon as well. We actually went to school together and hadn’t seen each other in 12 years! By chance she just moved to Cologne a few months ago. Green walls are important in film production. Since it’s rather bright green I decided to go with frames for the pictures on this wall. I like that my dad’s face is reflected on the left. 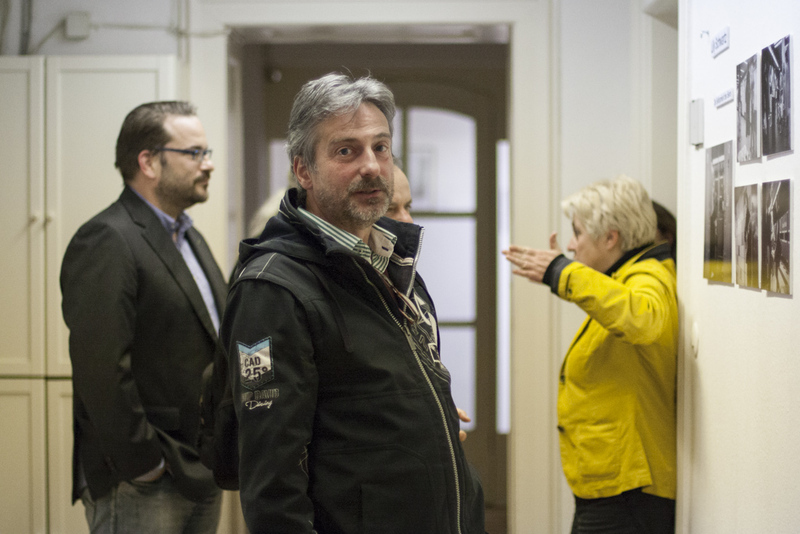 On the right Torsten Maassen, the CEO of Picture Puzzle Medien. He is the one who made it all possible! 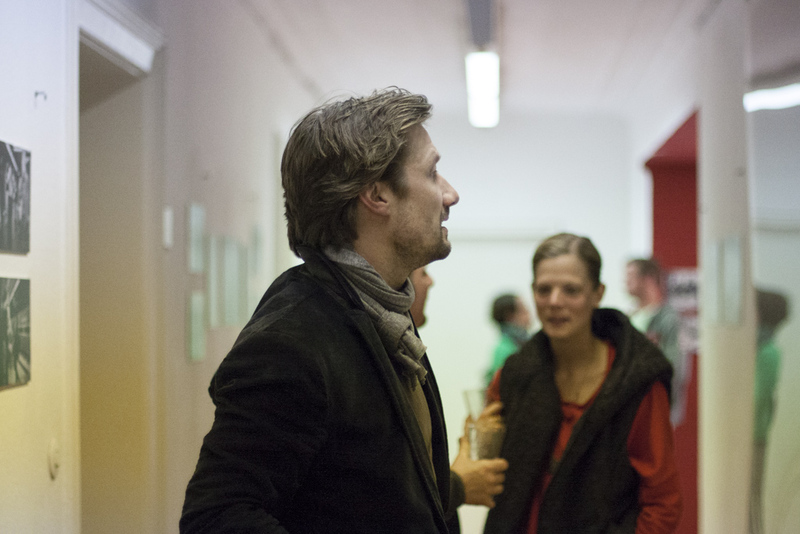 Actor Christoph Kottenkamp looking at my pictures. Taking a picture of usch taking a picture of me. Or something like that. The next one taken with: Olympus Pen E-PL3 and Panasonic Lumix 20mm f/1.7 ASPH. This was also taken the night before like the first one. This last picture was not taken by me – obvious since I’m in the frame – but by my best friend usch, who apparently is also my very own personal photographer. 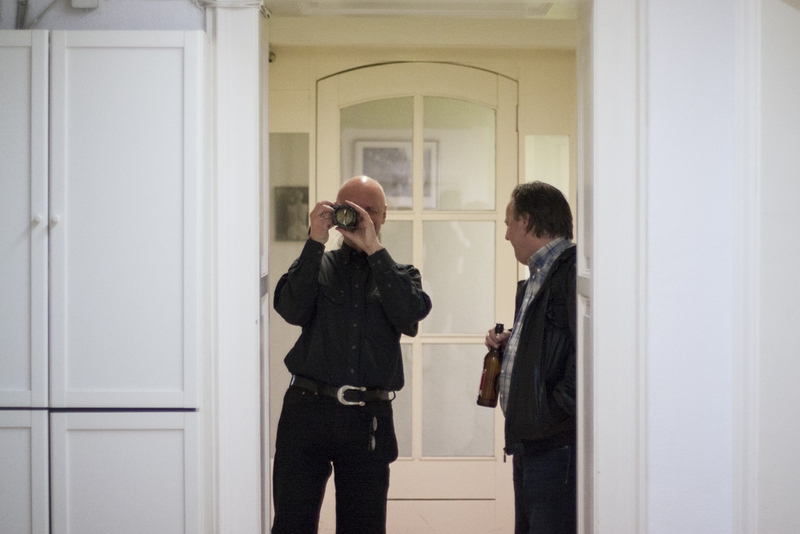 He was shooting with a Sony NEX-7 that night. 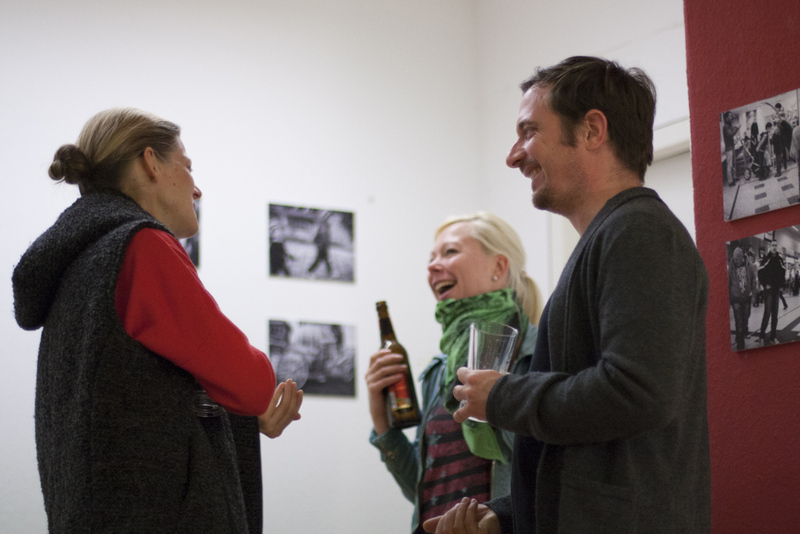 Here I was talking to Christoph Kottenkamp about one of my pictures. 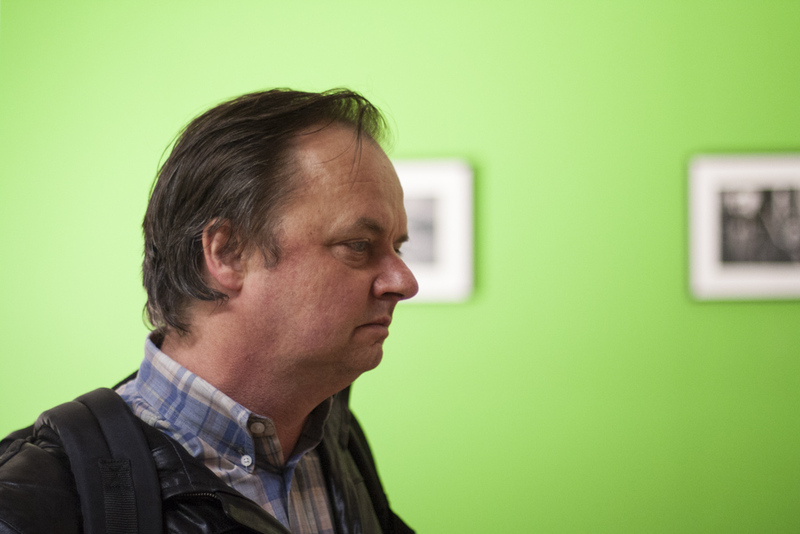 I was walking with him through the exhibition because it was a good opportunity to observe some reactions. I rarely get the opportunity to see such reactions, so this was really quite interesting. 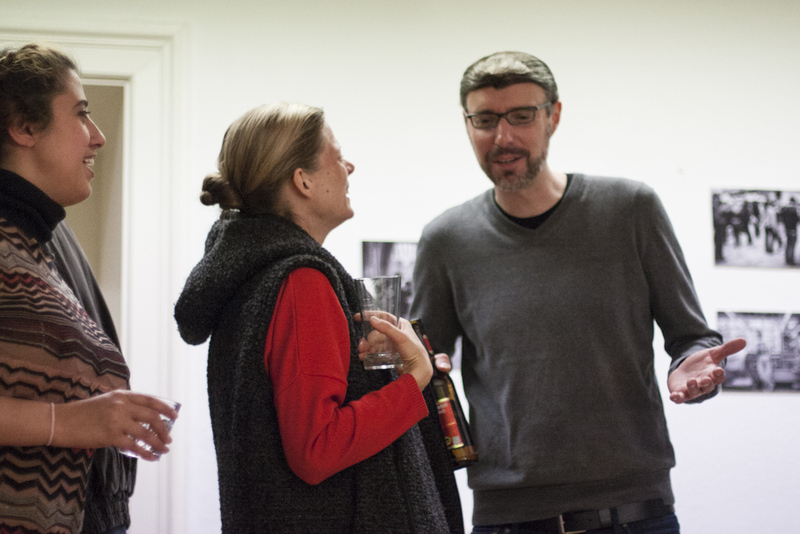 I had a great time at the vernissage and I would also like to use the chance to thank Torsten and everyone else from Picture Puzzle Medien for making all this possible. 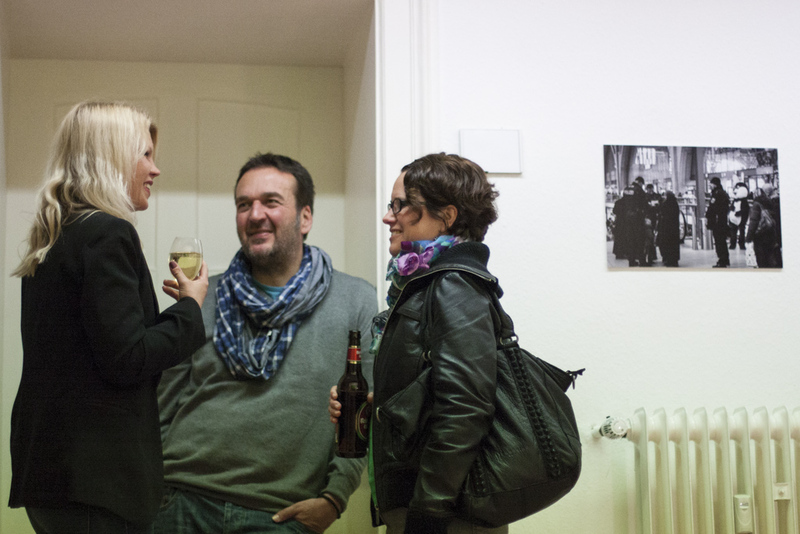 They really put in a lot of effort to make the vernissage a nice evening and I really appreciate the opportunity to show my work in their rooms this week. 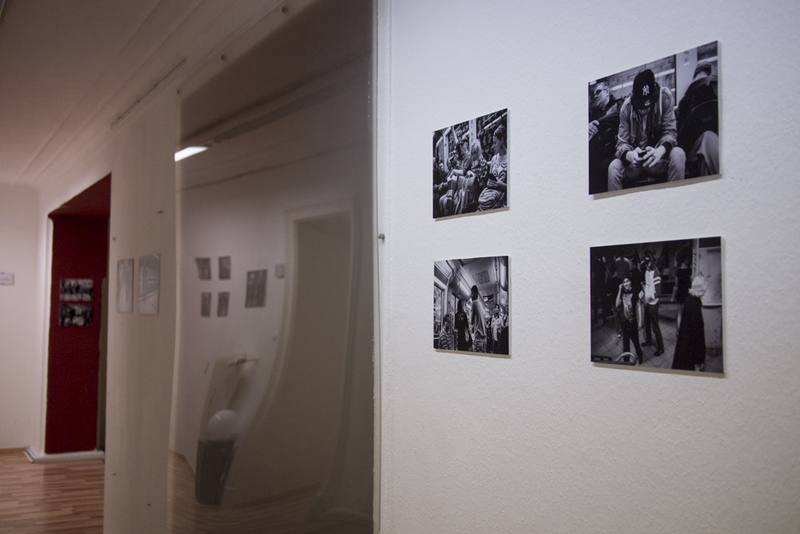 You still have the chance to see my exhibition until Monday 19th of May 2014 at Picture Puzzle Medien, Goebenstraße 3, Cologne, Germany, 10am-7pm on weekdays, weekend upon request. 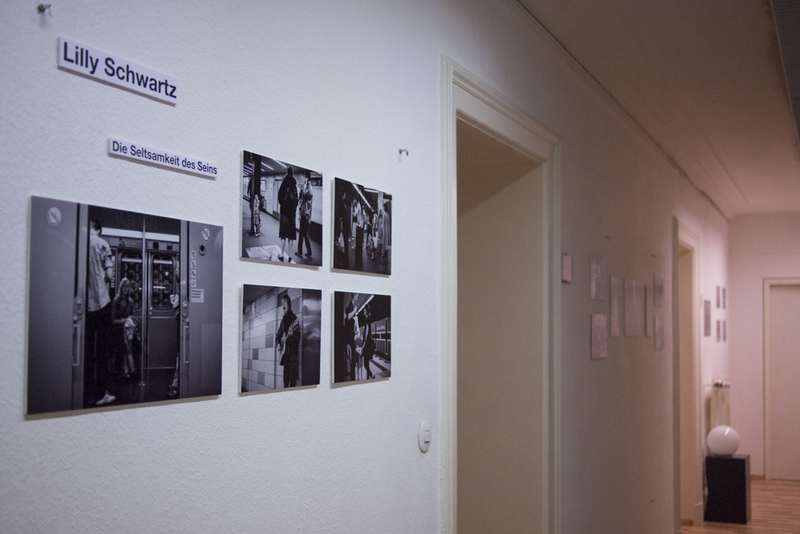 See the full exhibition announcement in German on the website of Picture Puzzle Medien. You did it! Great! It seems it was another good moment with many people attending! Brava! Thanks Robert! 🙂 It was a really nice evening! He, ich freu mich für Dich. Weiter so! Congratulations! Looks like a really nice event and your shots look great. Thanks Richard! It was a nice evening indeed. 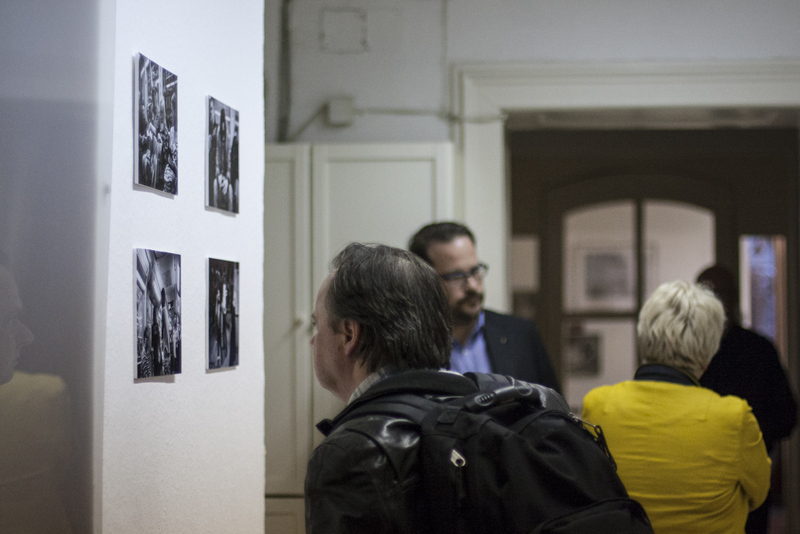 It’s a completely different experience to see the pictures printed and displayed like this. I also thought that they looked very nice on the walls.